Ø There has to be four players in your defensive zone or on your defensive side of the midfield line at all times. This is typically the goalie and three defensemen. Midfielders can and do stay “back” and in particular when a defensemen is clearing the ball and can run it over the midfield line. In this case the Midfielder will typically raise their stick and call out “middie back” so the referee can easily count the players. If there is not the correct number of players on the defensive side of the field this is a change of possession infraction and the other team is awarded the ball at midfield. Ø Typically there are three players in the attack zone unless the team has penalty and is a ‘man down’. Ø The box around the crease is called the “restraining box” or in lacrosse terminology the “box” The lines around it are called restraining lines. During faces offs the defense and attack must stay in the “box” until possession for one team or the other happens and the referee calls this out. Ø The small rectangles to either side of the box are called the “alleys”. When an infraction is called by a referee that is a change of possession the team taking the ball will begin play here if the infraction occurred in the Defensive or Offensive Zone. If the infraction occurs in the midfield area the ball can be awarded in the wing area or the center. Ø The “crease area” is 9’ radius circle around the goal. Only the goalie can be in this area or defensemen for that team can run through it. However, when the ball is outside of the crease neither the defense or goalie can re-enter the crease. A goalie is considered in their crease even if one foot is on the line and they are reaching out with their stick. Once the ball is in the goalies possession they have three seconds to exit the crease. If an opposing player touches or checks the stick of the goalie while they are in the crease it is goalie interference and the ball is awarded at the midfield line. This includes the goalie being in the act of passing. 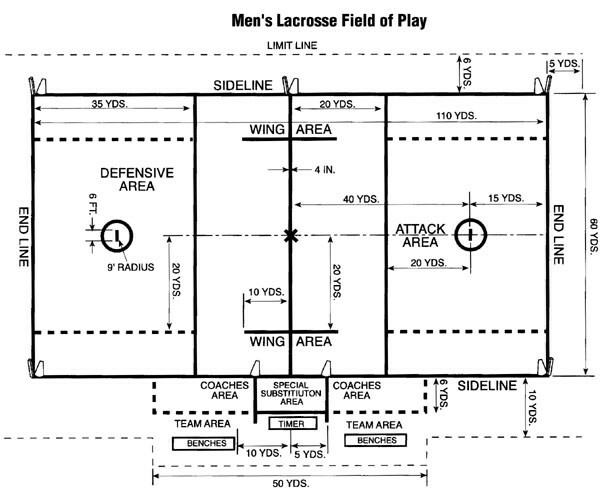 Ø The “wing area” is where wing midfielders line up for face offs and can not leave until the whistle is blown by the ref. It is common to see one of the wing midfielders rush to the area of the face off to try to gain possession of the ball and the other to line up further down the line and run to a defensive position several yards behind the face off circle in case their team does not win the face off. Ø The limit line on the sideline opposite the benches is where the spectators watch the game. It is against the rules to be a spectator on the player’s side of the field. Attack: The attackman's responsibility is to score goals. The attackman generally restricts his play to the offensive end of the field. A good attackman demonstrates excellent stick work with both hands and has quick feet to maneuver around the goal. Each team should have three attackmen on the field during play. Midfield: The midfielder's responsibility is to cover the entire field, playing both offense and defense. The midfielder is a key to the transition game, and is often called upon to clear the ball from defense to offense. A good midfielder demonstrates good stick work including throwing, catching and scooping. Speed and stamina are essential. Each team should have three midfielders on the field. Defense: The defenseman's responsibility is to defend the goal. The defenseman generally restricts his play to the defensive end of the field. A good defenseman should be able to react quickly in game situations. Agility and aggressiveness are necessary, but great stick work is not essential to be effective. Each team should have three defensemen on the field. Goal: The goalie's responsibility is to protect the goal and stop the opposing team from scoring. A good goalie also leads the defense by reading the situation and directing the defensemen to react. A good goalie should have excellent hand/eye coordination and a strong voice. Quickness, agility, confidence and the ability to concentrate are also essential. Each team has one goalie in the goal during play.